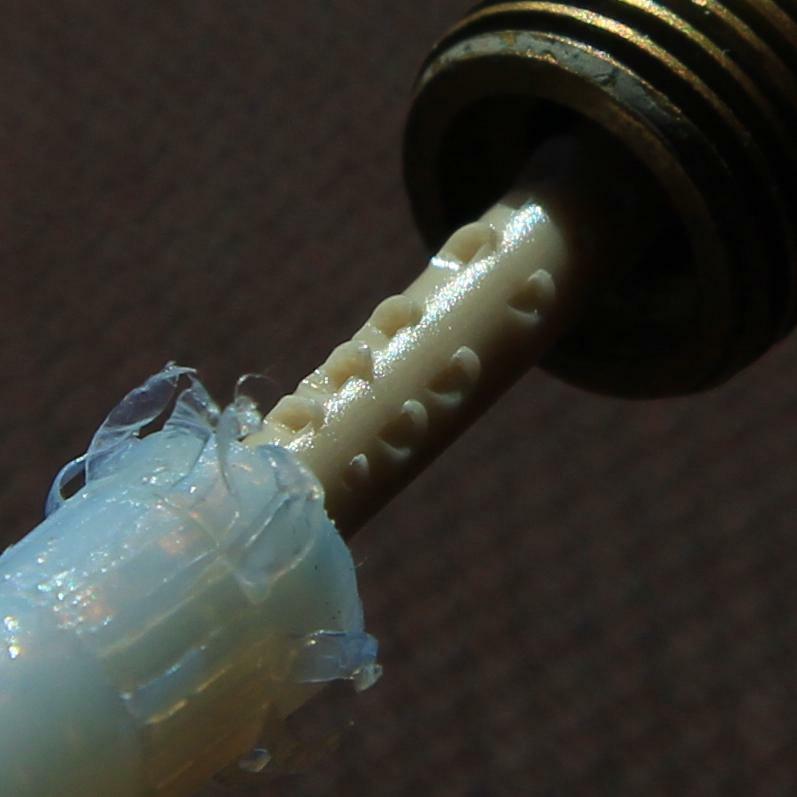 3D printer improvements: No slipping, no grinding: not always a good thing! Note: the push-fit connector is reversed on the pictures, sorry for that! The tube clamps on the blue side! Obviously I had to disassemble the head completely to remove the PLA/Teflon mix, until the head was perfectly clean. I failed the first time as I probably left a tiny bit of PTFE on a sidewall, which clogged the nozzle again shorty after. I sticked pieces of PLA quickly forth and back to remove most of the molten plastic and used the thin wire trick (see my post about cleaning a hot end). I also knew I had reached the lowest extrusion temperature, so I had the choice to reduce the speed or to increase the temperature back a bit. What I learnt and my conclusion. Tightening the bolt completely is not a smart solution to force the filament into the nozzle when it cannot, such as when overfeeding, or with too low an extrusion temperature. This also illustrates my opinion on the weird race for the "best ever gripping driving bolt"... My experience tells me I just need to give the filament a chance to slip on the driving bolt unless I add a sensor that can detect an excessive pressure and reduce the feeding rate. This is mostly where and why a spring is very useful on the feeder idler: do not thighten it completely, unless your bolt is not very efficient and that it lets the filament slip anyway before havoc. As a rule of thumb, better let a system "break" on an expected place than see it break something unexpected, that may be much more annoying to fix... For this very reason, I probably do not want to use the same efficient clamp I used on the other side of my bowden, as the printer would then probably destroy a support structure, like stripping the push-fit connector off of its wooden threads.